You just can’t help to think of root vegetables once Autumn is in the air. I keep buying loads of beets, carrots, sweet potatoes and parsnips. Recently I found this sweet potato recipe in the September issue of Bon Appétit. The idea of these flavors was so unique I had to prepare it . The Bon Appétit recipe calls for Speck which is an Italian cured meat much like Proscuitto. I used pancetta, however, any smoked type cured meat is possible, even turkey bacon. I found two different types of sweet potatoes at the market. Chimichurri is a piquant sauce or marinade traditionally used on grilled meat, typically containing parsley, garlic, vinegar, olive oil, and flakes of chili pepper. It is “often billed as ‘Argentine barbecue sauce,’ and we enjoy it with many other dishes far beyond the grill. The chimichurri was wonderful with the roasted sweet potatoes and the pancetta adds a nice smoky flavor. Heat oven to 425°F. 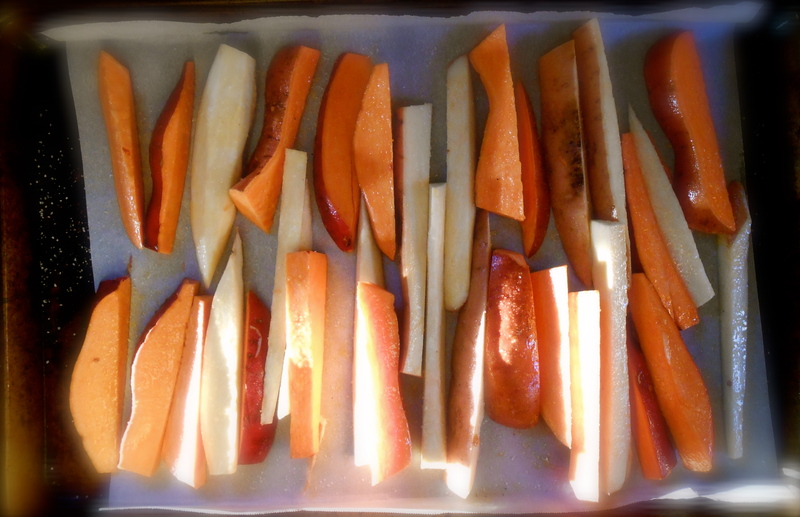 Toss sweet potatoes and 2 tablespoons oil on a large rimmed baking sheet. Season with salt and pepper. Roast, turning once, until tender, 25-30 minutes. Meanwhile, pulse cilantro, parsley, oregano, thyme, and garlic in a food processor until finely chopped. With motor running, slowly add vinegar and remaining 1/4 cup oil and process until combined. Season with salt and pepper. Spoon chimichurri onto a serving platter and top with sweet potatoes and pancetta. This sounds wonderful! I never would have thought to use a chimichurri with sweet potatoes, i can just imagine how flavorful this is. Very flavorful indeed Suzanne. I would not have thought this up either. I have been finding some good ones in Bon Appetit lately. :) We loved this for sure. I like this kind of food. Feel good food. Yes! I was doubting for a while if I had missed something. Glad to know there are different types, just like human beings anyway… :p Un abrazo, love to see your home-cooked recipes. Real stuff. Thank you Liz. :) Use ’em now while they are in season! We’ve been roasted 4 or 5 beets every week for our lunches! Love them! YUM! I am feeling like i need cooking time with you again! Let’s do it! Soon…k! What does your weekend look like? Interesting! I’ve only considered chimichurri (so delicious! so hard to spell!) as a sauce for meat but really like the idea of pairing it with root vegetables. We’re chimichurri fiends when it comes to barbecued meats but resting roasted root veggies in a chimichurri puddle is an excellent idea! And it looks great too, which is always a bonus. I love the sound of this, and think it would make a delicious summer warm BBQ salad too. I just roasted a bunch of carrots last night for dinner. ‘Tis the season, all right. I would enjoy these sweet potatoes roasted by themselves but you’ve piqued my curiosity when you served them with a chimichurri sauce, too. Like Richard said, it sounds wonderful. Roasted carrots sound wonderful! I think I need to do that too. I love them. The chimichurri was delightful with sweet potatoes, something I’ll do again for sure. Delicious recipe and lovely photos. I’m always so flattered when you comment on my photographs. :) Coming from you it is the highest compliment one can receive. I am so happy you used chimichurri,,powerhouse of flavor! That is indeed quite the veggie dish! Looks delicious and very pretty! Oh I love the combination! I’ve been MIA lately but, I am to return soon…I’ve missed your posts! I noticed! So glad to see you back! I love your comments and thank you so much for checking in again. Welcome back! Looking forward to your posts too. Thank you! You are a sweet person that I missed, even though we are fairly new friends…it still means a lot to me…thank you! Lovely mix of vegetables– good warming for winter supper. Your recipes all seem so healthy and delicious at the same time. I am such a huge fan of root vegetables (especially parsnips, beets and sweet potatoes), like you! The combination of chimichurri and any yam is a personal favorite. You have elevated the duo with something crunchy and salty! Oh my, I can’t wait to make this for a dinner party – or just for me. :-) Gorgeous photos and great recipe – so beautiful, elegant and flavorful. Thank you! :) Yes, we do share a love for roots! 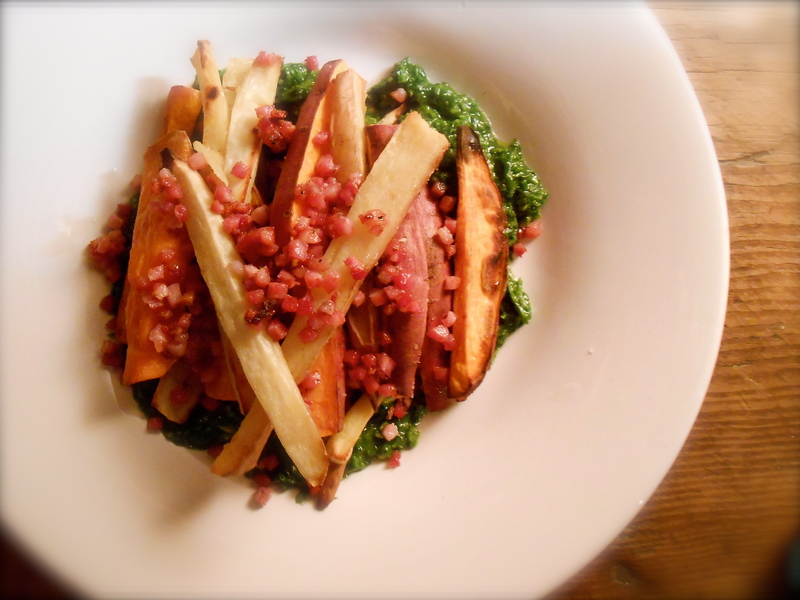 You are currently reading roasted sweet potatoes with pancetta and chimichurri at COTTAGE GROVE HOUSE.